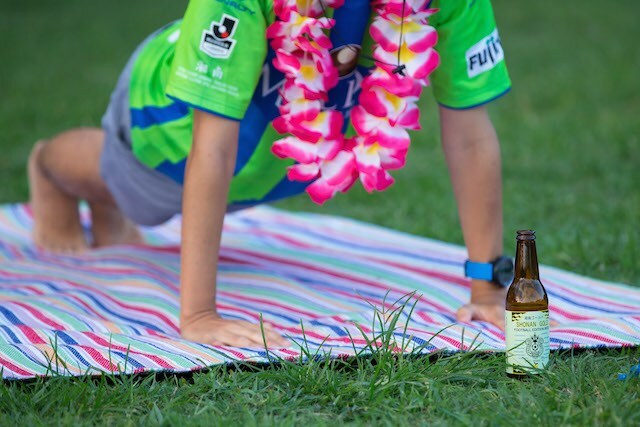 As part of Shonan Bellmare's International Day they will hold a pre-game “Beer Yoga Lesson”!!! So if you are thinking about heading down for International Day here is another fun reason, as well as the Shonan Tennen onsen next to the Bellmare Stadium (http://www.yunokura.com/) -- where you also get a free beer if you show them your Bellmare Football tickets! That's a yoga, watch football and relax in an onsen day trip right there!!! It is said that the “Beer Yoga” was born in one of the biggest beer consumer country, Germany. Since its pictures are very impressive, it has been spread internationally through SNS to Switzerland, Australia, Great Britain and Japan. As clear by its name, it is done drinking beer, but those two weren’t combined just because it would be funny. It aims achieving higher relaxation and happiness through the combination of the philosophy of Yoga and the joy of drinking beer. And another notable characteristic of beer yoga is, that the participants work on yoga all together with chatter and laughter. As the previous time, of course we offer you “Bellmare Beer” of our official club partner Sanktgallen Brewery. “Bellmare Beer” is kind of sweets beer, brewed using rare and new orange “Shonan Gold” which was invented in Kanagawa and still now produced only in Shonan region. The lesson will be lead by Mr. Keisuke KIKUDA, who took charge of the last time. We will welcome all football fans, beer fans, yoga fans and yoga beginners. We’re looking forward for your joining! One bottle of beer is included. Clothe which don’t bother your move. *We will reply your applying mail as a confirmation. Please make sure that your Email server can receive Emails from bellmare [at] mf.scn-ne.jp. So a Tokyo day out, 1 hour from Shinjuku/Shibuya/Shinagawa down towards the seaside for beer yoga, watch football and an onsen right next to it!